The Nuwai 5 Watt ALX-253L provides light by using a Luxeon V LED powered by three 123A lithium cells and a driver circuit which regulates the power to the LED. 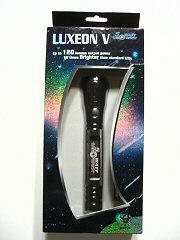 The result is a very bright LED torch which provides near-constant output for over 2 hours. Body: The body of the Nuwai 5 Watt ALX-253L is made from machined aluminum. It carries a black anodized finish to provide some degree of resistance to corrosion and wear. The body is thick and serves as the heatsink for the Luxeon when it is run for any amount of time. It will get warm. Several deep rings are machined into the body tube and around the center of the body tube is a wide band of checkering for grip. 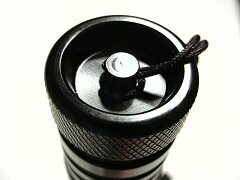 The tailcap is also checkered for grip and uses a recessed post for lanyard attachment, allowing it to stand on end. There is a flat panel machined into the side of the light which aligns with the switch, making it easy to locate. The switch is on the body tube just below the head. The head is fluted with six plateaus which serve as an anti-roll device. Bezel/Reflector/Bulb: The head of the light contains a plastic lens, a partially textured plastic reflector, the Luxeon V LED, and a driver circuit tucked underneath. The head unscrews and takes the reflector with it. 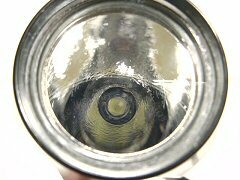 Inside is a hollow aluminum ring which holds the rest of the pieces in place. Output description: When describing the output from this light, "Retina Scorcher" comes to mind. This thing is bright! Output is in the form of a medium spot with a bright corona and spillbeam. 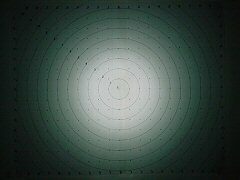 The center of the spot is shows the very slight but infamous "doughnut hole" which is usually seen with Luxeon V LED lights, however with this particular light it is just barely noticeable. Output is very white with no noticeable tinting. Runtime Plot: Over 2 hours regulated on three 123A cells. Pretty good considering the shear volume of light it produces. Runtime completed with Duracell batteries. Switch: The switch is on the side of the light, sits in a recessed dimple, and is covered by a slightly domed rubber cap. This cap rests flush with the surface of the light and so is not easily subject to accidental activation. The head of the light is larger than the body, so resting the light on its side on a flat surface will not cause the switch to touch anything. The clickie switch is a reverse clickie, turning the light on after clicked. Gentle pressure allows for momentary operation only after the light is on. It provides both tactile and auditory feedback when activated. Seals: Both ends of the light are sealed with O-rings for water resistance. I would classify it as "dunkable ". Intentional submersion should be avoided, but I would fully expect it to survive a drop in a puddle/stream with little or no water entry. If it does get wet inside, simply disassemble as much a possible and allow to dry before using again. Ergonomics: The body walls are thick so it has a bit of heft. Good diameter, good texture, not overly abrasive checkering. The switch is easy to locate and operate. 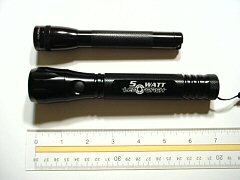 Batteries: Three 123A lithium cells power the light. Do yourself a favor and buy them in bulk online at about 1.25 each instead of shelling out $10 a pair at Wallyworld. Batterystation.com self-branded cells have been shown by a third party to be excellent 123A cells. Accessories: A nylon wrist lanyard and light duty nylon belt sheath are included. Conclusions: Great light if you need lots of output and can keep feeding it lots of batteries. By no means is it a long range spotting light - the Luxeon/reflector combination in this light provides a directed beam which is fairly wide. Great for medium range tasks which require a lot of light.